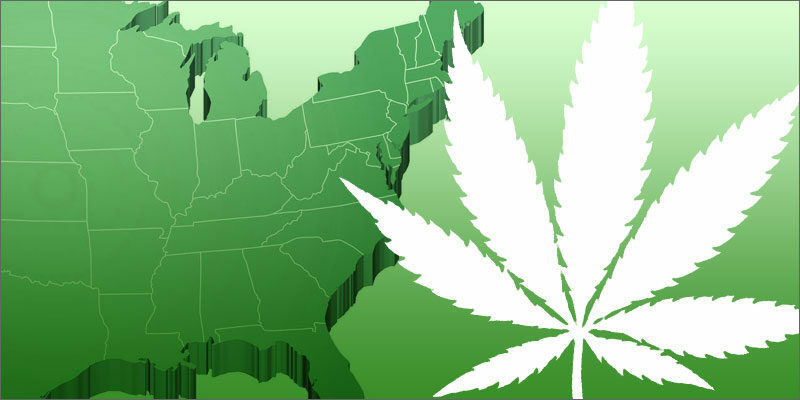 It’s natural that the United States cannabis industry blossomed from the West Coast, where Colorado, Oregon and Washington implementing recreational cannabis laws and California gearing up to do the same in 2018. The West Coast, California in particular, has had a long history with cannabis with much of the marijuana in the U.S. grown by the cannabis cultivators hiding, often in plain sight, throughout the Emerald Triangle, made up of Mendocino, Humboldt, and Trinity counties in Northern California. With Nevada implementing recreational cannabis laws, this has only increased the relationship between the west coast and cannabis. So what is happening on the East Coast? Massachusetts – Massachusetts took the giant leap towards the end of 2016 as becoming the first east coast state to legalize recreational cannabis. The vote was close, but it passed and allows individuals 21 and over to legally purchase cannabis along and permits residents to grow up to six plants in their home. The bill has been amended to raise the tax on retail cannabis from 12% to 20%, establish strict requirements for labeling and packaging of products, and allows town and cities to restrict cannabis in their own jurisdiction. Even with the revisions, this is a great achievement and one that will hopefully motivate neighboring states to implement their own cannabis laws. New York – New York has been referred to as “The City of Dreams”, and right now patients who need to access cannabis are dreaming that New York improves their Medical Marijuana Program. Passed by lawmakers in 2014 and officially signed into law by Governor Andrew Cuomo in 2015, the law didn’t go into effect until the beginning of 2016. The issue is that when New York set up their program, they made it too restrictive by only permitting it for individuals with debilitating or life threatening conditions and only allowing 5 companies to open 20 dispensaries in the entire state which, according to Vice News, breaks down to one dispensary every 2,700 square miles. Luckily for the patients of New York, changes have been made to try and ramp up the program by doubling the number of dispensaries in the state, allowing sufferers of post-traumatic stress disorder (PTSD) and chronic pain access to the program, and making access to cannabis easier by allowing home deliveries and publishing a certified list of registered practitioners in the city. Now, the program has more than 25,000 certified patients and over 1,100 certified practitioners. New Jersey – New Jersey passed its medical marijuana program in 2010 and started it in 2012. You would think that for a program that has been operating for 5 years they would have worked out all of the kinks and have an effective program in place. Unfortunately that is not the case as Governor Chris Christie could not be more opposed to the program and cannabis in general, ironic since President Donald Trump named him to lead the Opiate Epidemic Team but that’s a whole different story, which has hindered the program’s effectiveness. New Jersey had 12,514 patients and 1,030 caregivers registered with the program as of December 31, 2016. The issues of the program lie in the restrictiveness of who qualifies, the high cost of the medicine as New Jersey has an expensive price per ounce and only allows a handful of dispensaries. A sixth was just approved to open. But Christie leaves office at the end of 2017. Democratic gubernatorial candidate Phil Murphy announced his full support for recreational legalization in New Jersey. If Murphy is elected, Democratic State Senator Nicholas Scutari (who introduced the bill) said “Given his support and the leadership of the house, I think we have obviously a legitimate opportunity to do this in the first 100 days of the Murphy administration for outright cannabis law done legislatively”. Pennsylvania – Governor Tom Wolf signed the Pennsylvania Medical Marijuana Act on April 17, 2016. This program will allow patients who suffer from 18 different conditions to access medical marijuana starting in 2018. Towards the end of June of this year, 27 dispensary license winners and 12 cultivation license winners were announced with the caveat that each dispensary winner has the option of opening up to three dispensaries meaning that there will be at most 81 dispensaries to start. Each business has 6 months from the announcement to get their business operational and the goal is for the program to be fully operational in the beginning of 2018. After one year, the program will be evaluated and there will be the opportunity for more dispensary and cultivation facility licenses to be granted. Florida – The southernmost state on the east coast, Florida is known more for its warm weather and beautiful beaches than it is for its current Medical Marijuana Program. That is because when the program was initially passed in 2014 it was extremely restrictive by only allowing access for 4 qualifying conditions and only offering low-THC and non-smokable products. That is until over 70% of Florida residents voted for Amendment 2 at the end of last year, which expands what ailments qualify patients for the program along with allowing higher-THC products to be prescribed. This sounds great right? It would be IF Florida’s Office of Medical Marijuana was able to keep up with the increased demand that came from the expanded program. Currently the office employs only 12 people, 9 of whom are part time, to handle a program with 31,000 certified patients. Florida needs to figure out how to best keep up with the demand of new patients and physicians and make the process of obtaining a medical card for patients and required training for physicians more accessible or individuals will continue to suffer. The progress being made on the East Coast is very encouraging. It shows the stigma surrounding cannabis fading away as its medical benefits are recognized. As the programs in these states continue to develop, the hope is that some of the issues facing them will be worked out to make these programs operate as efficiently and effectively as possible while also ensuring the safety of everyone involved. Max Meade is an insurance advisor with Brown & Brown who specializes in assisting cannabis ventures across the United States in procuring proper insurance coverage and starting their businesses. Seeing cannabis help a close family friend inspired Max to want to help cannabis venture’s succeed and help patients. He may be reached at MMeade@bbdvins.com or 856-552-6358.